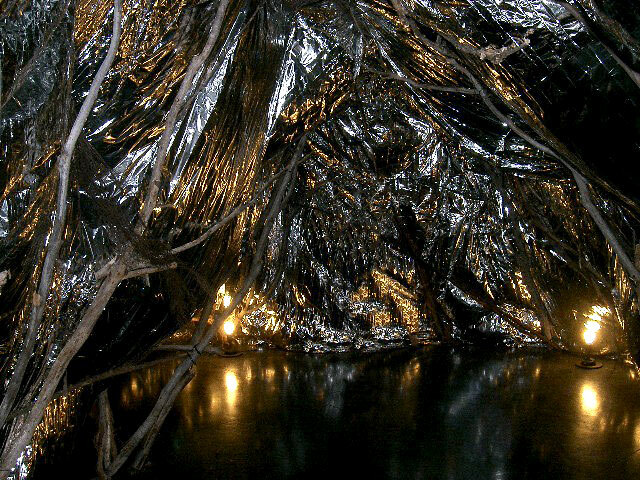 A cave like entrance presents itself to the visitor as they enter the exhibition leading to a long winding tunnel that is lined with silver insulation foil and tree branches, lit by floor mounted electric light bulbs. The foil moves with the natural movement of air causing not a rustling of leaves but of artificial surfaces. At the end of the tunnel the viewer enters a large installation space, confronted with a effusive pop art Garden of Eden, a Magic Forest. It takes a while to work out what is going on, there are so many elements to the sculptural piece. 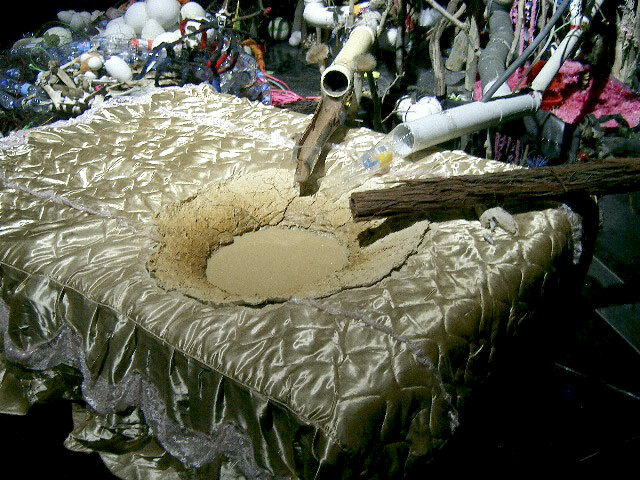 The main elements are buckets, toilets, basins and drainage pipes, plumbing fittings that all lead to a bed with a drying dam in the centre of a satin bedspread: the ‘waterhole’ of the exhibition title. The waterhole is fed by water dripping from a medical bag suspended high in the air above the dam, a nice touch. The rest of the forest and pipes are dry. The installation comments on our water supplies and the ‘technologies of production’ (Foucault) that permit us to produce, transform or manipulate things. We might install rainwater tanks to catch water but if there is no water to catch in the first place then we are in trouble: we make our bed and have to lie in it, the empty basins like our catchment areas, dry and bleak. Other elements of the forest have an environmental theme, the installation developed by the artists in response to the extensive drought most of Australia (and it particular Melbourne) is experiencing. 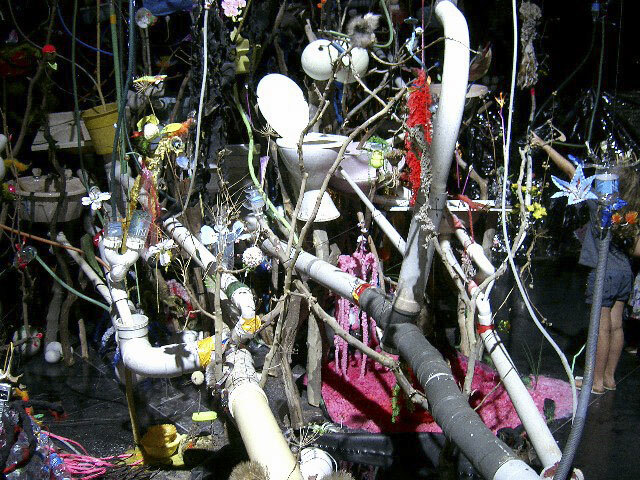 Here are spiders with hairy legs and mobile phones for bodies infesting the installation, plumbing fittings with natural seeds sprouting from their ends, brightly coloured crystal forms fed each day with water by gallery staff so that they grow. 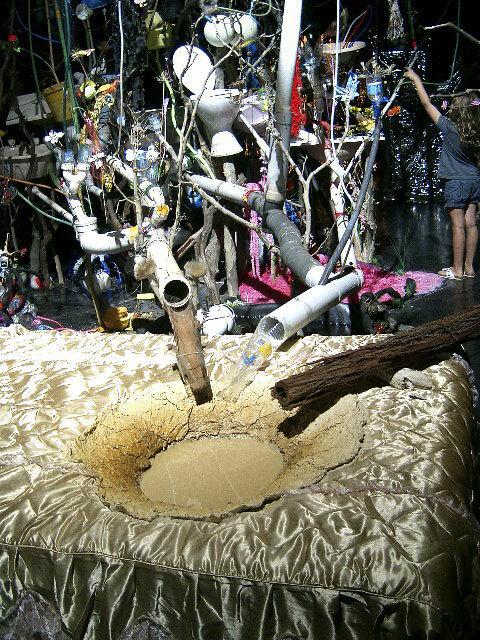 An upside down umbrella with Polar bear images printed on it’s material has imaginary water draining down a bamboo pipe into a bucket; empty water bottles form a large nest with broken eggs inside; artificial plants, bones, crabs, seaweed and flying stuffed owls are form some of the other elements in the installation. Climbing a few steps we enter a ‘bird’ watching gallery replete with binoculars to observe the humans in the forest as much as the forest itself. A water cooler sits incongruously in this watching space, silent and somehow complicit in its ironical presence. The viewer then moves to another room. 4 video projectors display another water themed installation on the gallery walls, the videos meeting in the middle of the walls and reflecting each other. Ambient music accompanies images of rain!, spurting water, owls and plastic pipes, plastic flowers and plastic horses as the viewer relaxes on a waterbed in the middle of the space. The effect of the music and images is quite meditative when combined with the gentle rocking of the waterbed, the projections of the video forming kaleidoscopic ‘Northern lights’ on the ceiling of the gallery. 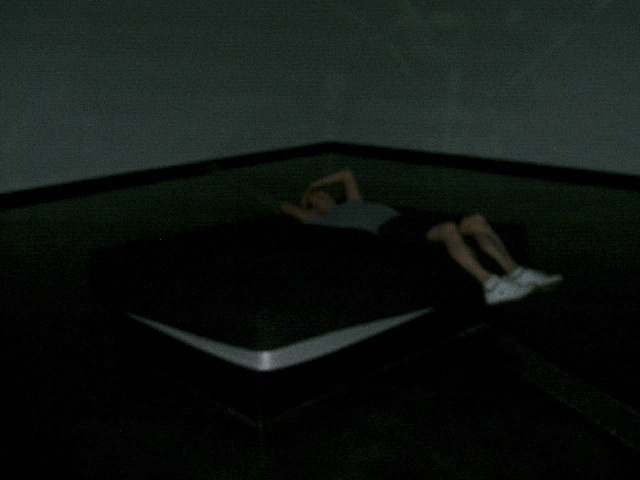 This room is an extension of the themes of the large installation. Moving forward the viewer enters another room – the meditation room. This room is most effective in encouraging contemplation of the different planes of our existence and our orientation in (environmental) space. Three beds are present, one suspended from the ceiling by four metal rods. Climbing onto this bed the movement from side to side caused by your weight makes you feel seasick and slightly disorientated. Above the second table is a wonderful mobile made of twigs, branches, dried leaves, plastic flowers, beads, plastic bags, baby dummies and jewellery moving gently in the breeze. Lying on the table with the mobile about a foot above your head things drift in and out of view as you change the focus of your eyes – close, mid, far and then onto the moving shadows on the ceiling. The most effective bed has a small meteorite suspended in a net bag above it. The viewer slides underneath the ‘rock’ placing the meteorite about a foot or so above your face. The meteorite is brown, dark and heavy, swinging slightly above your ‘third eye’. You feel its weight pressing down on your energy, on your life force and you feel how old this object is, how far it has traveled, how fragile and mortal you are. It is a sobering and enlightening experience but what an experience it is! Entering the final room small colour photos of people being hugged from behind and lifted into the air, laughing, line the gallery walls. These are the weakest elements of the exhibition and seem to bear no relation to all that has passed before. Running off of this gallery is an alcove that is a dead end, a full stop to the exhibition with an installation Desalination plant for tears. A cheap Formica desk sits at the end of the space. 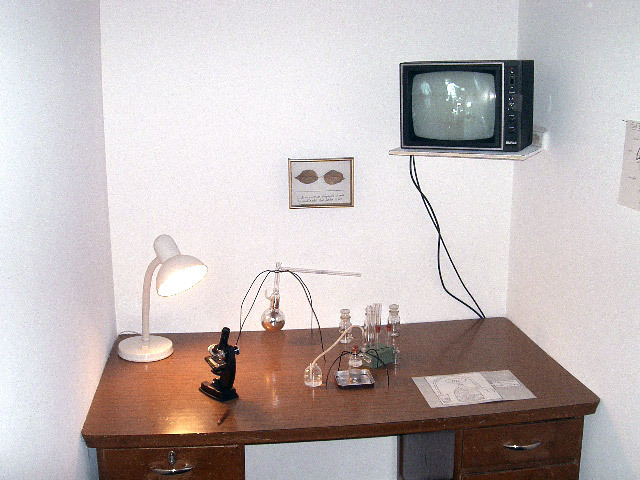 Perched above the desk is a tv showing live black and white images of the earlier bird watching gallery – the watcher now the watched. 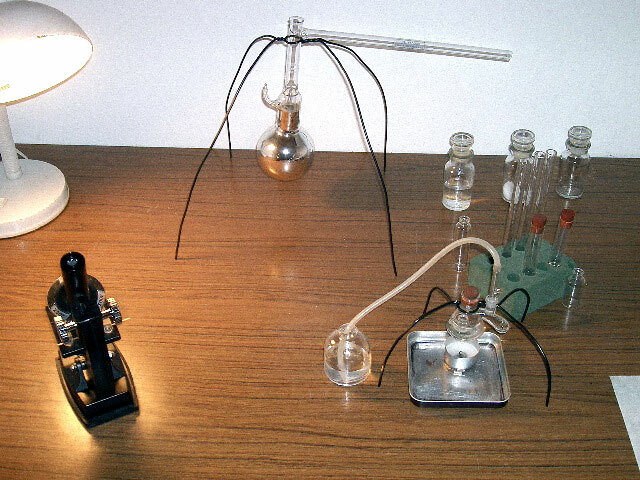 On the desk itself is a microscope (with slide of human tears), pencil, a candle for heat under a glass flask of water (looking like a spider from the large installation!) and various glass test tubes and vials. A diagram explains the working of a Desalination plant for tears, an analogous reference to the desalination plant earmarked for Wonthaggi, south-east of Melbourne. 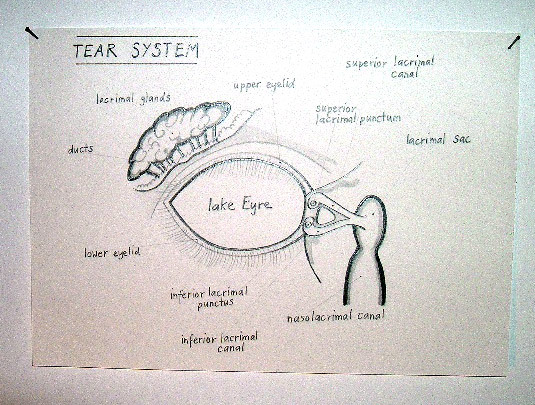 Irony is present (again) in the 2 leaves grown at Singapore Airport by desalinated water (2008), two framed, brown dead leaves, and in the Tear system diagram where glands have turned into forests and the eye into a lake (see below). This is a magical and poignant exhibition that is a joy for children and adults alike. Children love it running around exploring the environments. Adults love it for it’s magical, witty and intelligent response to the problems facing our planet and our lives. Go and enjoy this interplanetary collision. Highly recommended! Many thankx to the Australian Centre for Contemporary Art for allowing me to publish the photographs and text in the posting. Excellent, I really want to go and see this, it’s so inspirational to my own MA work at present. Brilliant exhibition. Well done to you both.